Oh dear. Am I about to upset sensibilities? Indonesia prides itself on being a ‘moderate’ Islamic state, which ignores the fact that a few pompous politicians in Aceh, that den of corruption Padang and in a few other places have declared sharia (Islamic) law to be above Indonesia’s constitutional law ~ which guarantees freedom of worship, except for Jews and Jehovah’s Witnesses ~ in their domains. It is the Jakartass contention that malevolent forces with a hidden agenda are at work. I do not believe that this worldwide wave of protests is a spontaneous (= righteous) uprising. After all, it has taken four months since the cartoons, which can be seen here, were first published to produce the hotheaded reactions which now dominate the front pages. As Indcoup opines, if the cartoons had been ignored, then they would have meant very little in the scheme of things. But no. Meddlesome mullahs had to demonstrate that they were more pious than others by inflaming the passions of their flocks. They’ve also shown that they have absolutely no sense of humour. 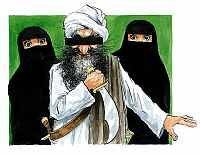 I particularly like this cartoon which ~ and read my lips guys ~ does NOT depict Muhammed. This, to my mind, is a serious comment on how adherents of Islam generally subjugate their womenfolk. In the immortal words of Alfred E.Neuman, get a life guys. Stop thinking about the virgins you say you can expect to deflower in the hereafter and start living in the here-and-now. Respect lives and try to encourage others to similarly respect you. Your lack of a sense of humour would be funny, if it wasn’t so sad. If Christians can joke about their religion, like here and here, why can’t you. Is Islam a religion without joy? Remember. God is everywhere, including Peru. His prophets, like yourselves, were/are mere mortals. None of us have the divine right to say that we are right. And a final, not entirely irrelevant, point. Why is Jesus generally depicted as a white man? If Islam would accept portrayals of the Prophet Mohammed, would he be a white man too? Bloody Mary would have had you burnt at the stake. Which is the point rather. Freedom of expression is our guarantee that those types of things do not happen in the west anymore. Did you see Ibn Warraq’s article today? I have linked on my site. Jakartass, can I correct your link to my site, it’s 404 because of the comma on the end. Very fussy about these things, I am. One comma removed and one article read. The reference can be found in the Jakartass Encyclopaedia of Religious Folklore in the Indonesia chapter. Jehovah’s Witnesses stated that although they enjoyed a high degree of religious freedom, there were incidents in which their children ran into trouble at school for not taking part in the weekly flag salutation. Religion is not about joke or joy, it’s a faith, something that u believe with ur heart. no God, no Prophet, no life after death… no responsibility.